I am beyond excited to announce that, thanks to Silhouette, I am giving away a Silhouette Portrait cutting machine! That’s right! One of my lucky subscribers or followers will win their very own cutting machine, the Silhouette Portrait. To enter to win the Silhouette Portrait cutting machine, you need to be a subscriber or follower of my blog. You can sign up over on the left side of this blog (if you are not there already). And leave a comment under this post, only one comment per person please. For an additional chance to win, please follow my Pinterest page if you have not already, and leave an additional comment on this post that you did. You have until midnight MDT on Sunday March 3rd to enter and the winner will be announced on Monday March 4th. Now for more good news Silhouette is having a mega sale! 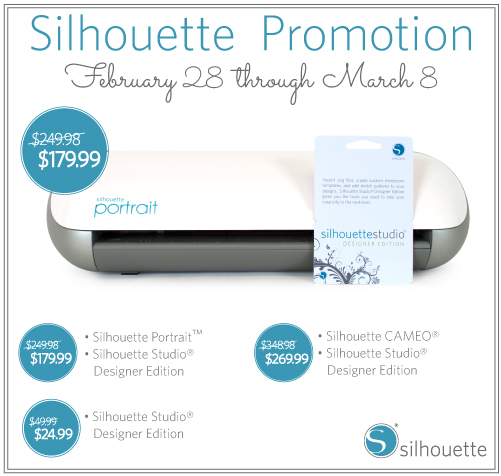 Can you believe you can purchase the Silhouette Portrait™ packaged with the Silhouette Studio Designer Edition Software for $179.99, or the Cameo packaged with the Silhouette Studio Designer Edition Software for $269.99? Click here and type in the Promo Code BOUTIQUE when you order to receive the savings. For those of you that already have a cutting machine, you can purchase the Silhouette Studio Designer Edition Software for $24.99. This software is incredible and I use it on every project. I use the ruler tool for increased accuracy on every project including the one below! The Studio Designer Edition software also allows me to import SVG files. To see a detailed PDF comparison between the Silhouette Studio software and the Studio Designer Edition software, click here. Did I mention that I love the advanced knife and eraser tools and you will too! One of my favorite features of the Silhouette Machines is the print and cut feature. You use your Silhouette machine in conjunction with your color printer to print and cut amazing designs and projects. Did I mention you can also cut and use the fonts already installed on your computer? Can you tell I love my Cameo? I made this Silhouette print and cut clover pillow box that I purchased from the Silhouette on-line store in a matter of minutes. I also used this adorable clover kisses print and cut file to decorate my Hershey kisses. I am making several of these to give away at our Saint Patrick’s Day dinner party so I am extremely grateful that they are so quick and easy! Have a great day and you can click here if you would like to order any of the above products. Remember the Promo code is BOUTIQUE. Please feel free to spread the word and don’t forget to enter my giveaway! such a great program to me. Very nice project and thanks for the chance to win!!! This is a very yummy giveaway i want to win this! Oh by the way i love your clover pillow box project i'm longing to make something like this. Awesome giveaway, Linda! I would love to win this. What a wonderful giveaway!! I would be so thrilled to win such a great machine, Thanks so much for the chance to win!! Thank you gor the chance to win this awesome product. Following you on pinterest as well. I would love to win a Silhouette Portrait. All my favorite crafters seem to have one and love it more than all other cutters. Thanks for the change to win! I'd love to win! Thanks for the opportunity. Thanks for sharing all your lovely projects with us. You always have the most timeliest projects and this one for St Patrick's day is a good example of that! Love it!! I've been a follower of your blog and on Pinterest for some time! Wow, what a great giveaway, would love to win! Already a follower. Just starting following you on pinterest :-) Thanks for the chance to win. I have followed your blog for a long time! Thank you for this great chance to win! Blog follower, thanks for the giveaway! I am so excited!! I'd love love LOVE to win this machine! Thanks for the giveaway. I am a faithful follower of all your sites. For a second entry, I already follow you on Pinterest. Thanks. GREAT GIVEAWAY!!!!! Thanks so much for a chance to win. Been a follower for awhile now, realy like all your videos. This is an awsome giveaway thanks for chance to win. Wow, I would love to win this giveaway. I am a follower & subscriber. Thank you for the chance to win a Silhouette. I've been wanting one but can't spend the money right now. Super give away and I just followed you on Pinterest too! I've never used this machine and see so many neat things to cut and would so love to get to do this too! Great Giveaway! Definitely would love to win this one! Also, already a follower for pinterest and your blog! Thanks for the chance to win! Love your Blog. Thanks for all the info you give. I would love to win! I am a follower. Thanks for the chance to win a great prize! Love all your projects and tutorials. Wow, the things I could make with this! I love your blog and I'm following on Pinterest too. Thanks for this great giveaway. I'm so excited to be following you on Pinterest. I love your style! Im a follower and love seeing all your wonderful projects. Thanks for the chance!! WooHoo, You are awesome, Linda. Sure would love to win this for a young lady I know at church. She's awesome at making things, but having 4 kids is awfully bad on the finances. She make all the kids clothes. The Portrait would make awesome appliques for their clothes. I've been following your blog and I love it. Thanks for the chance to win a Silhouette. I'm now following you in Pinterest, too. Love my Cameo! Would love to win!Chris G.
Ohmygosh - what a wonderful prize! Thanks for the opportunity to win such an amazing prize! Wow! Awesome! I would love to win this and already have the software to go with it! I'm a Pinterest follower now! I have been a follower of your blog for a couple years & your videos have helped me a lot. When I win the Portrait I will be spending more time with you. Thanks for the chance to win. WOW!!! What a great giveaway! I LOVE all the stuff you make with your Cameo! This St. Patty's Day candy box is so cute ~ and I love that you put the labels on each of the kisses! Thanks so much for the chance to win the Portrait machine! Someone's gonna be lucky for St. Patty's Day! Hope it's ME!!!!! I just signed up to follow you on Pinterest! Thanks for the additional chance to win the Portrait machine! OMG! Wht a give a way. The Cameo is definitely on my wish list. I have been a follower for quite a while now. Thank you so much for the chance to win this awesome prize. It sure would be a nice 39th Anniversary(March 9th) gift! Thanks for a great give away. I already am a follower of your blog. I have liked you on Facebook and follow you on Pinterest! I just became a follower in pinterest and cannot wait to spend some time on your boards to get some great ideas. Love your newsletters! Now a follower! Be nice to win the Silhouette Portrait Giveaway. love ur blog. thanks for the chance to win! Just started following you on Pinterest. I will be headed there when I have more time to browse! I love your creative ideas and always look forward to your blog posts and videos! Thanks for the great chance to win a Silhouette Portrait. I'm now following you on Pinterest too! Thanks so much! Wow, wow, wow!!! What a give-away. Thanks for the chance to win. And your St. Pat's box is ideal and very pretty. I love your blog. You always have such great ideas and beautiful projects. Keep up the great work! Thanks for the chance to win too! Love your blog and tutorials! Thanks for sharing all your creativity with us, and the chance to win a great prize! I've repinned your pin. Really like the projects, and the chance to win a machine is great. Really like your projects - I seem to be struggling to leave a comment though! The proof that I'm not a robot is clearly a problem! This is a wonderful giveaway. Thanks for the chance to win. Whoops! I've just seen that I have multiple comments - and it seems that others do too. I thought it had rejected my entry of the code. DUH! Sorry. OMGoodness!!!!! I would love to win this!!!! I am a long time follower and subscriber! Thanks for the chance to win! I also am following you on pin intrest . Linda, you have some wonderful pin boards. I followed them all. popup says in valid code. OMGosh!! Linda!I have been drooling over the projects you make with the Silhouette!! THANK YOU for giving us all a chance to win! Just started following you on Pinterest. I love the wonderful ideas -- keep 'em coming! Hi Linda, I've been a subscriber to this blog for some time. Thanks for this chance-of-a-lifetime opportunity to win this wonderful prize. I just became a follower and have subscribed to your blog for quite awhile now and I would soooooo love to win the silhouette. Thanks for the chance to win it. Just began to follow you on pinterest. Don't know why I hadn't earlier. Can't wait to go back to peruse your boards. They look wonderful. That print and cut feature sounds awesome. Fabulous giveaway. Love your adorable pillow box too! Great giveaway contest! Thanks for posting this contest! Thank you for the giveaway. I have one of the first Silhouette machines. It still works great but the featurs on the new machines are incredible! Awesome! Thanks for the opportunity to possibly be able to enjoy a Silhouette. Love all your projects and I'm a big fan. Wow! what a giveaway! I've just joined Pinterest and I have become a follower of you! You have so many interest and ideas. Thank you SO VERY MUCH for all the time and effort you put into your blog and conveying wonderfully informational videos! I have learned much from you! Now following your Pinterest page. Great inspiration! Thanks for the opportunity to win ... such a great prize! I am a follower of your blog through Google Reader. I just "followed" your Pinterest page! Thanks for another opportunity to win! I went to visit your Pintrest page and clicked the "follow" button! May I suggest that you include a still photo with your videos so that we can easily have a summary when we pin your wonderfully helpful videos? Thanks for all your sharing! Enjoy reading your blog and what a great give away. Hoping that Santa would send one my way - but . . .
What a adorable little pillow box! I'd love to win the Silhouette. How exciting! It would be wonderful to add a Silhouette to my collection of cutting machines!!! Thank you to the company for offering you this great opportunity! And I am already a Pinterest follower of yours. Love your creations!! Follow you via email - thanks for the giveaway. I've heard so many good things about the silhouette! Thank you for the chance to win one! I'm already a follower. Just got done following some of your boards on Pintrest. Woo Hoo! An extra chance to win, thank you!! Thanks so much for the opportunity to win this machine. I have been a follower for such a long time and sigh everytime you use yours because I do not have one. Smile. Got my fingers crossed. I just added you to my Pintrest list. Thanks! What a giveaway!! Have been following you for quite some time now and have learned so much from your blog. Thanks for the opportunity. Oh my gosh...this would be a dream come true! I'm a follower and would live a Sillouette! I've been reding about the Cameo and Portrait and have decided I need one! Thanks for the opportunity. Love your pillow box and thanks for a chance to win!! I would love to win one of these machines. What a wonderful opportunity. What an awesome giveaway!! I subscribe already to your blog. Wow, great guy bag. Am already a subscriber and follower. I am starting to get excited about the Silouette W/each passing day, even though I have a Cricut. Love all the adorable SVG cuts I have been seeing and wish I could cut them out. Really hope I win! Like the gift box and the Hersey kisses are adorable with the little sayings/embellishments. I am following you on pinterest. What a wonderful giveaway. I would love to own this great machine. Unfortunately it is not yet in the budget. I asm follower and plan to be pinterest follower starting today. Thank you for the chance to win. Great giveaway! Would so love to win! I've been a follower long time! At least since start of circle! I'm now following you on Pinterest. Thanks for sharing your creativity! I also follow you on Pinterest! Thanks again! Thanks, Linda, for your generous give-away!!! After using Cricuts for years, now everyone is blogging about the Silhouette machines. Linda, I have also clicked to follow you on Pinterest..thanks! Wow, Linda - what an impressive giveaway!How I would love to have a Silhouette!! Thank you for the chance. Your little St. Patrick's pillow box of treats is very cute! Thanks for the idea. I am a happy follower of your Pinterest boards. You've got so many wonderful ideas there! I am an email follower and am now a pinterest follower. Thank you so much for the chance to win this great giveaway! Your videos give us great ideas and I enjoy watching them on my Kindle at night in bed! Id love to win one of these...first thing Id make is Vinyl Letters/Numbers for our mailbox :-) Thanks!! Happily following you on Pinterest :-) Thank You!!! What a wonderful giveaway! I would love to win! Thanks for the chance! I love your blog and am already a follower. Your tutorials rock! Thank you, for a chance to win the baby brother to my Cameo! I already follow your blog and now am following you on pinterest too. Thanks for posting the contest and the coupon, I used it this morning to upgrade. What a fun an cute pilow box. Awesome giveaway. I would love to add this to my craft room. I know I would use it daily. Thank you for the chance to win this fabulous product....so many creative ideas! I already follow your blog but am now following you on pinterest as well. Thank you for the contest and the coupon. I already love following your blog and I would love to win! Thanks for sharing. Thank you for the chance to win! I have followed your blog for some time. Love your Friday posts! Sounds like a wonderful gift. Hoping I win. Thanks for the great chance. I love getting your blog and now am a Pinterest follower. Thanks for sharing your great ideas! Thanks for the chance to win, and a big Thank You to Silhouette as well. You always come up with such cute projects. Thanks for the chance to win!! I'm so excited. The Silhouette is on my bucket list. Hopefully I can win one.Thank You for this opportunity! I'm a long time follower here and Pinterest too! I love those St. Patrick's Day boxes and candies too! This is on my Christmas list. Thanks for the chance!!! the machine looks awesome!!! What fun to play with!!! What a great give away! Thanks for the chance to win!! Would love to make cards & other die cut outs to share with friends! Would love, love, love to win this! thanks for the opportunity! wow!!! such fantastic inspiration!!! thank you for the chance of winning!! I subscribed! Thanks for the chance to win! Thanks so much for the chance at winning your awesome giveaway! I am now following you on Pinterest too! I'm a subscriber and this is an amazing giveaway! love your blog-thanks for the chance to win!! Wow this is cool that you get to give away a cool cutting Machine!! Would love to win!! I am now a follower on pinterest and have been a follower and a subscriber with your blog!! Thanks!! A friend intoduced me to your blog this morning. What a cool place you have. I will enjoy following, as I am new to the paper craft world. I am interested in making paper houses and miniatures. Can you direct me to cutting disks that do that type of thing? Thank you for bring this fun craft and chance to win a wonderful machine. I love my Cameo. The best machine ever. Wholly Tomolly, I whould be over the moon to get my hands on a Cameo! Gosh what a generous offer, I follow The Paper Boutique and carry your badge on my Blog Proudly! Hope to win but if I don't congrats to the winner anyway. I absolutely love your blog. I look forward to getting your email each day. Thanks for an amazing giveaway and mostly for sharing your talent and ideas with us.